If you’ve ever played FIFA, you’ve probably noted the importance of a forward’s “finishing” rating to how often they finish their chances. That’s how it works in the video game, but is “finishing” a real life skill significant enough to make an impact in a forward’s goal scoring tally? 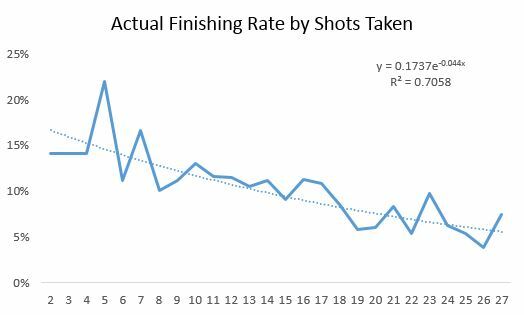 While I have yet to meet a data analyst who thinks that “finishing skill” is as relevant to goal scoring as most soccer fans tend to believe, there doesn’t seem to be a consensus in terms of whether “finishing” is a repeatable skill. In other words, can forwards depend on a superior ability to convert chances year to year? 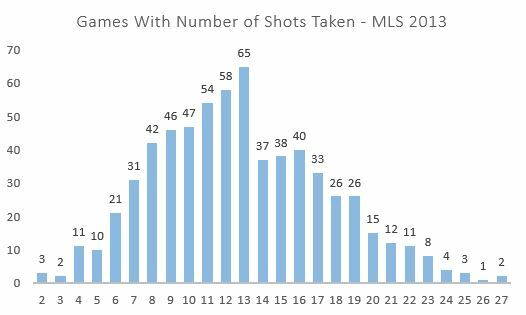 With forwards like Gyasi Zardes (16 goals in 2014) and Cyle Larin (17 goals in 2015) bursting onto the scene by converting a high percentage of their chances on goal, the question within MLS is as important as ever. Are these players scoring so many goals because of some underlying finishing skill, or are their unusually finishing rates something closer to statistical noise? Is finishing a skill of any importance within MLS? 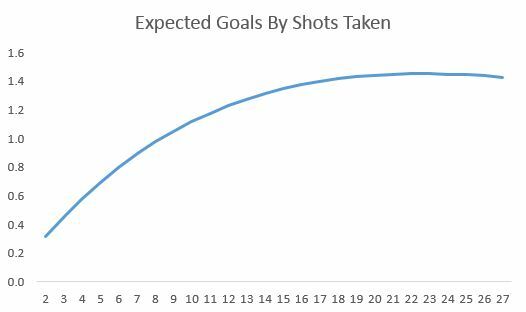 One important tool we can use for answering such a question is to study discrepancies in expected goals (xG) data. 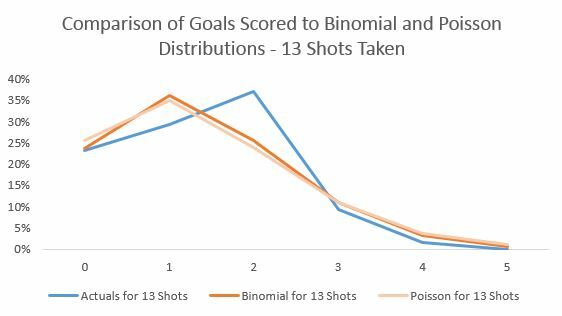 Since the expected goals model is built around league averages of conversion, if finishing were a skill of any statistical note we would see a consistent out-performance of the model by certain shooters who are highly skilled finishers. 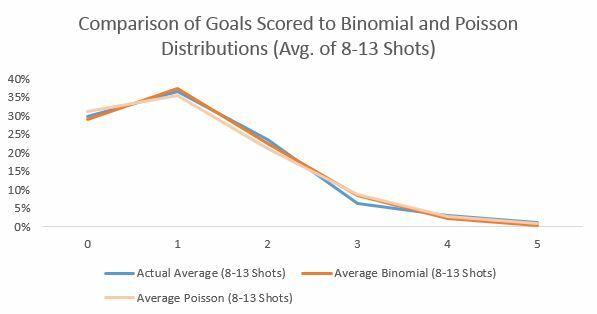 But before we get into repeatability for individuals, I’d like to use goals minus expected goals (G-xG) data to look at the question in much broader strokes. I know I shouldn't be surprised by the Impact stealing a match on the road, especially considering Sporting's lack of strength at home as of their recent string of outcomes. Though, with all the statistical pointers, it's quiet uncanny that they came up with even a point, let alone all three. It's hard to look at the tackles, interceptions and clearances and not think that it's a by product of the Impact largely being on their heels for the majority of the match. That in large part is due to the style which the Montreal Impact implements. The team as a whole has functioned with 48% possession through 12 matches and even less possession (44%) in away games. It's not a bad thing, but it naturally produces more defensive events. 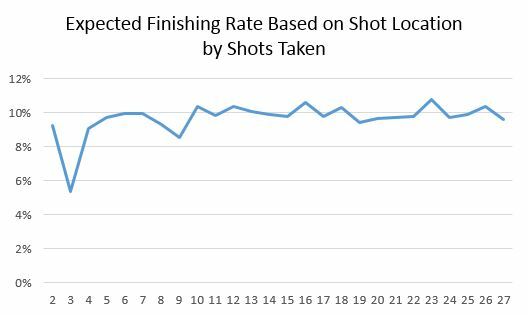 Much of our discussion during the podcasts has dealt with shots and their predictive nature. 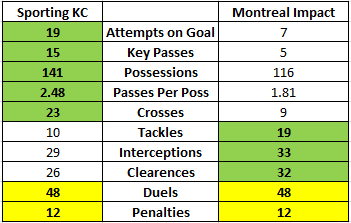 Montreal has been at the forefront of the discussion, with amazing results despite being outshot on both total attempts at goal (12 to 15 per game) and actual shots on target (4.9 to 5.2) Montreal Impact is currently now sporting 26 points with a goal differential of +7. Not to mention they are boasting the highest conversion rate in the league of 15.3%. Better than the next highest (FC Dallas, 13.9%) by nearly a whole point and a half. Matthias, Drew and I have discussed whether or not Montreal can continue to maintain such a high finishing rate. It's a legitimate question considering the construct of the situation but, as pointed out by Ravi Ramineni in a discussion this morning on twitter, ‏the problem with making such assertions is that we're looking purely at the shot totals rather than looking at the qualitative state of the shot. However, while it's interesting enough to question whether or not the Impact are going to stick around and continue to score goals at their current rate, I'm going to leave that for another day. It's even more interesting that Kansas City came up with twice the amount of attempts on goal and the only scored once. That one goal was on a foul that was made right on the line of the 18 yard box. Had the linesman not been on his game, that call could have easily been a free kick. The question that I really have is more of why was Sporting unable to build upon their chances. Looking at the amount of clearances that the Impact had I kind of wondered if the fact was that they just couldn't maintain the needed pressure upon Troy Perkins goal. Looking at this you can see three real bunches. First at the 69th-71st minute, Again with the 76th and 78th minute and then in the final moments game a solid run of 90 to 94, ending with Kei Kamra's shot that just drifted wide. Ultimately, I'm more inclined to believe that Sporting did just as much to not earn a result as the Impact did to really earn one. But while most people would be willing to chalk this game up to luck, I just think it's the largest example of what the Impact do well, and that's disrupting opposing teams while allowing the Impact to sit in their own defensive third. I'm still not inclined, as I'm sure Matty isn't either, to give the Impact the full rights of being a team that is "for real". But they certainly continue to prove their case week in and week out.